The Converse Blog: 'S Valentine's Day Post: New Micro-sites for V-Day! 'S Valentine's Day Post: New Micro-sites for V-Day! Today is either one of your favorite days or one of your least favorite days of the year. Either way try your best to enjoy your day, let the people you love know that you love and we'll all make it through the day. Speaking of getting through the day, Converse is at it again with some micro-sites to mark Valentine's Day. Have you ever wondered what happened to all of those left over heart shaped boxes of Valentine's day candy? You haven't? Well now you won't get the chance to now, if you check out this site featuring kissing Ross. http://www.loveislikeaboxofchocolates.com/. Love is like a box of chocolates and Ross really loves his boxed Chocolate. The second site is a really interesting twist on a famous line spoken to those recently dumped people of the world. I won't give it away, but I am truly impressed by http://www.ijustgotdumped.com/. Go ahead and checkout I just got dumped for a quick pick-me-up. 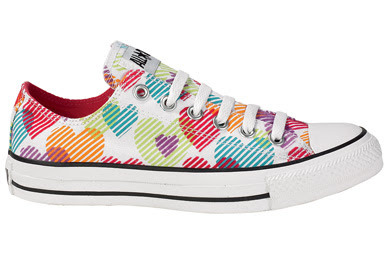 Also head of to Journeys and pick up these heart pattern chucks for your sweetheart today. Have a great Valentine's Day.